Skydivers, do you want to learn to speed fly? See all your skydiving and BASE jumping friends taking epic mountain flights on their speed wings. 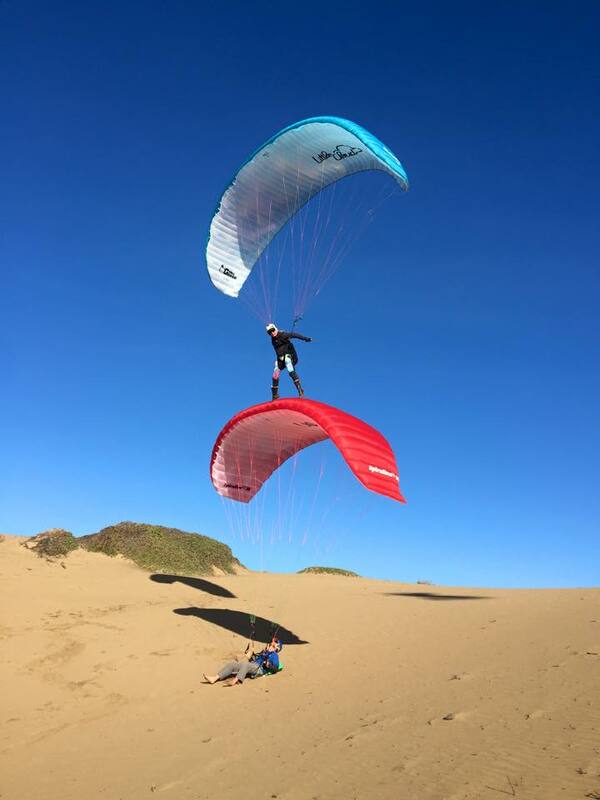 Come out to the sand dunes in Monterey and learn the basics of paragliding and ground handling before you try to run your small wing off a mountain. Price Negotiable - Depending on your time in the sport (skydiving) and how you transition. I would like to see less broken skydivers trying to speed fly with little to no paragliding experience and knowledge. I usually do a day rate and let you work on the skills at your pace. Skydivers, do you want to learn to speed fly? See all your skydiving and BASE jumping friends taking epic mountain flights on their speed wings? Come out to the sand dunes in Monterey and learn the basics of paragliding and ground handling here at Monterey Sky Sports before you try to run your small wing off a mountain. Speed wings are completely different animals than your skydiving canopy, even if you are an experienced swooper. There are basic skills skydivers lack the knowledge of - like ground handling, launching, and active piloting. Ground handling or kiting will save your life in a windy situation, it is also an important tool in understanding the flight characteristics of your wing. The more you kite, the better your understanding and skills will be once you are airborne. It is also a key skill which separates a good novice pilot from an advanced pilot. The feeling and muscle memory learned by practicing kiting carries over directly to your active piloting and pressure management while flying. Once you are skilled in kiting, you can then focus on your launch confidently, knowing you have the skills to react to whatever Mother Nature sends your way. Skydivers have little to no experience getting a glider or speed wing properly pressurized through the launch sequence. Whether it is a no wind front launch or a high wind reverse launch, it is just different from anything you have experienced while flying your skydiving canopies. During your canopy flight while skydiving the parachute is fully pressurized and loaded with your weight below it, the airspeed (with out any inputs from you on the toggles or controls) is constant. In order to get to that point with a paraglider or speed wing, you must first create enough airflow across the wing to create the lift needed to launch. This is a foreign concept to a skydiver who is used to being put directly into the flying part of canopy flight. It seems like a simple idea to grasp, but I assure you it comes a lot faster and easier with some instruction and coaching. Trust me when I say, you have no idea what you dont know about this sport. Coming into it with a back ground in skydiving or BASE jumping can be a great advantage, but it is still important to get a good base of knowledge of how paragliders fly. With my background in skydiving, competitive swooping, and time in paragliding, I would love the opportunity to pass on my knowledge and keep you out of the hospital. Come out and learn to kite and launch a wing in a safe non-committing environment. The sand is very forgiving and the wind is stable and smooth. I have student paragliders for you to learn on and fly so that you get the basics of paraglider ground handling and flight. Monterey is located 150 miles (two and a half hour drive) from Lodi, Ca and forty miles from Skydive Hollister. There are even a few fun BASE jumps along the way. Please feel free to contact me with any questions. If you can not make it out to California there are plenty of paragliding schools around the country that would be happy to teach you, contact me for schools in your area.